Team Oregon Motorcycle Safety Program, known as Team Oregon, is an American, Oregon-based motorcycle safety partnership between the Oregon Department of Transportation (ODOT) and Oregon State University. Headed by Steve Garets, it is funded by ODOT through motorcycle endorsement (license) fees and student tuition. 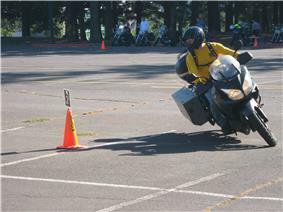 Team Oregon's training materials have been used in other states, including Idaho and Illinois, and it is the only official motorcycle safety program in Oregon. The program began in 1984. Since Oregon implemented the Team Oregon Motorcycle Safety Program, motorcycle fatalities have been reduced by 50%. However, motorcycle fatality rates are rising in both Oregon and nationally. Team Oregon's position, as well as that of the Oregon Department of Transportation's Traffic Safety Division, is that rider judgment and skill are critical in avoiding motorcycle accidents and fatalities. Approximately 70% of Oregon's riders receive training through Team Oregon. Team Oregon was nationally recognized through the Motorcycle Safety Foundation (MSF) and sponsored by the Oregon Traffic Safety Commission. In December 2006, Team Oregon and Oregon State University were sued by the Motorcycle Safety Foundation for copyright infringement in the United States District Court for the Central District of California. MSF alleged Team Oregon used their materials to develop their own program. Team Oregon and MSF settled the lawsuit out of court in December 2008. Some training programs are sponsored through local colleges, including Lane Community College, Chemeketa Community College, and Portland Community College. Team Oregon supported 2009 Oregon Senate Bill 546, introduced by Senator Vicki Walker, which requires mandatory rider education before endorsement. The bill was signed into law on July 23, 2009 by Oregon governor Ted Kulongoski and will be fully phased in by January 1, 2015. Walker is an avid motorcyclist who sponsored the bill to stem the rise in Oregon motorcycle fatalities. 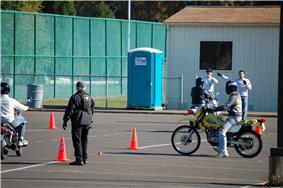 As of 1993, approximately 1800 students were receiving motorcycle training per year. In 2001, 89% of 5044 students were enrolled in the 16-hour basic riding skills course. Of these students, 70% were male (versus 87% of endorsed motorcyclists), and 85% of students completed the program. Student tuition was $95, and the cost for Team Oregon to train one student was $135. As of 2008, Team Oregon was teaching 8000 students per year. In 2011, student tuition for the BRT is $179. Classes often take place in parking lots, such as those at community colleges and schools, except for the most advanced classes, which use go-kart tracks. The Basic Rider Training (BRT) is a 15-hour course for novice riders. The course takes place over three days and provides seven hours of classroom instruction and eight hours of range (on-cycle) instruction. Training motorcycles and helmets are provided. For individuals with no riding experience, BRT is the recommended course, with 89% of all students enrolling into the BRT. It is required by law for new riders under 21. The Intermediate Rider Training, known as the IRT, is a full-day training program for students 21 and over who are familiar with a motorcycle, but who need more practice, evaluation, and guidance to become comfortable and safe on the road. It consists of four hours of classroom instruction, and four hours of range (on-cycle) instruction. As of January 1, 2013, Oregon law requires any new motorcycle endorsement applicant under age 51 to successfully complete a Team Oregon IRT or BRT class. On January 1, 2014 the age will go up to 61; and on January 1, 2015, all new endorsement applicants will need to meet the requirement. Persons moving to Oregon from out of state that already hold a motorcycle endorsement will not need to meet this requirement. The Rider Skills Practice, known as RSP, is a half-day (5 hours) of exercises on the range to tune up rider skills. It's recommended a student have 3000 miles of recent on-road motorcycle experience. The Advanced Rider Training, known as ART, is aimed at riders who have at least 12,000 miles of on-street riding experience. It consists of a two-hour classroom session and 4–5 hours of on-track education. Since the ART takes place on go-kart tracks in order to teach riding proficiency at higher speeds, it is only taught at Pat's Acres in Canby and in Medford. Team Oregon was recognized as the "best in the nation" in a 2004 American Institutes for Research study sponsored by the National Highway Traffic Safety Administration. The study identified three "best practices" areas of program administration, rider education, and licensing. Oregon received a score of 24, versus a mean score of 14.6 with a standard deviation of 4.9. ^ a b "We're Team Oregon". Retrieved 2009-12-18. ^ a b "Motorcycle foundation accuses OSU of copyright infringement". ^ Garets, Steve (2005-07-28). "Chart course for safe cycling". ^ a b c d Odegard, Kyle (2008-06-01). "Lawsuit against motorcycle group dropped". ^ a b Rose, Joseph (2009-04-13). "Conflicted after motorcycle tragedy". ^ "May is Motorcycle Safety Awareness Month in Oregon". salem-news.com. Retrieved 16 December 2009. ^ "Three-day motorcycle safety course offered". ^ "Motorcycle Safety Foundation Protects Intellectual Property Rights in Settlement with Oregon State University and Stephen Garets". ^ "MSF: Copyright Lawsuit Resolved". ^ Garets, Stephen (2008-05-28). "Team Oregon Motorcycle Safety Program Lawsuit Settled" (PDF). Retrieved 2009-12-16. ^ "Douglas County: State offers motorcycle training". ^ "SB 546 :: Oregon Legislature Bill Tracker - Your Government". ^ "Motorcycle crashes nearly double; new rules due Jan. 1". ^ "Senate Bill 546" (PDF). 2009-06-24. Retrieved 2009-12-17. ^ Rose, Joseph (2009-04-13). "Motorcycle diaries -- and diatribes". ^ "Laws emphasize rider training". ^ Christensen, Sally (1993-05-18). "Oregon Gets Handle on Keeping Cyclists Alive". ^ a b c "DOT HS 809 852, March 2005 (Team Oregon training program profile)". ^ "Communications New motorcycle-related laws focus on training". Oregon Department of Transportation. 2009-12-15. Retrieved 16 November 2010. ^ "Senate Bill 546" (PDF). 75th Oregon Legislative Assembly. Retrieved 16 November 2010. ^ Advanced Rider Training Track Guide. Team Oregon. February 2007. ^ "About Advanced Riding Training...". 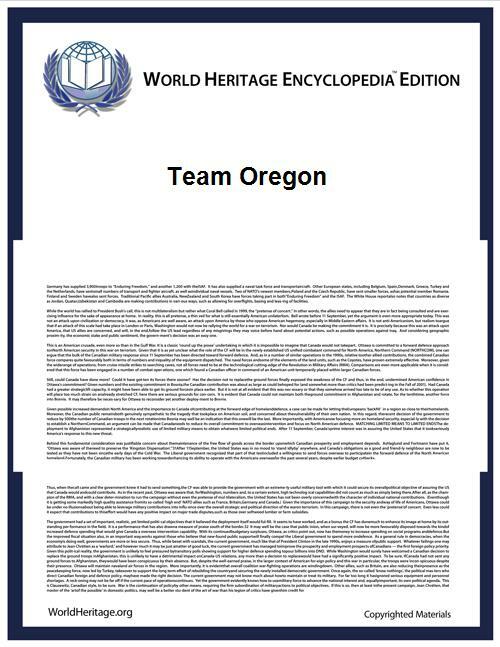 Team Oregon website. Retrieved 16 November 2010. ^ Baldi, Stephane; Justin Baer; Andrea Cook (2005). "Identifying best practices states in motorcycle rider education and licensing" (PDF). Journal of Safety Research 36 (1): 19.